Choosing the right type of wood for your home’s exterior and interior doors is goes a long way in ensuring that you have a look that is right for your home. 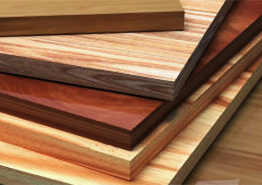 Many people purchase doors without giving much thought about the type of wood material used. It’s something that they should think about since the type of wood used in exterior double doors can change the look and durability of the door. Mahogany: While it’s true that mahogany is often associated with fine pieces of furniture such as desks, chairs and tables, it’s a versatile wood that can also be used for doors. In particular, its lush red color and ability to take stains well makes it a great choice for interior doors and window panes. Cherry: Cherry wood is a darker tone although its color has much more range than mahogany; hues can be anywhere from rich red to dark brown. Cherry also accepts stains particularly well, which makes it a wood type that can be used for a variety of doors. It is known to have many different potential character marks such as streaks of sapwood, pin knots and gum pockets. These items give each cherry door a unique look. Alder: Common to the Pacific Northwest, alder trees produce a wood that is becoming increasingly popular with homeowners around the United States who want a rustic look for their homes. There are two different types of alder: knotty alder and clear alder. Clear alder is relatively free from “imperfections” while knotty alder is more likely to have knots and burl clusters. Knotty alder interior doors take stain well, particularly shades such as mahogany, walnut and cherry. Oak: Few wood species are used more often in both exterior and interior doors than oak. It is characterized by its strong grain pattern, which gives each door its own look. It’s one of the lighter-hued wood types used in doors, ranging from light blonde to tan with a pink undertone. Douglas Fir: One of the softwoods, Douglas fir wood is a popular choice for front doors. The fact that it is naturally resistant to the effects of weathering means that you can install a Douglas fir wood door and know that it will last for years to come. ETO Doors has sold more than one million doors to customers throughout the United States since 2002. They are dedicated to giving customers access to high quality interior and exterior doors at affordable prices.